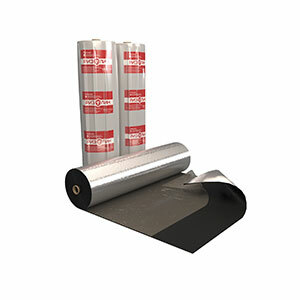 ; anti-radon protection of buildings. Rizolin FSa is made of tearproof reinforcing fiberglass cloth impregnated with bitumen-polymeric compound with a protective aluminium foil layer. The material is absolutely waterproof, resistant to rapid temperature changes, bioresistant. Due to protective aluminium foil layer the material is resistant to ultraviolet impact and corrosive environment that allows to maintain its waterproofing properties permanently. Can be used in all climatic zones (according to SNiP 23-01-99). The material is easy in application and does not require any special equipment. To apply Rizolin FSa one must only take off the release film, place the material onto a dry, dust-free surface and roll it down with a roller. (SNiP 3.04.01-87). ATTENTION: Self-adhesive material properties retain at an air temperature above +15 °С. At lower temperatures a little heat must be applied to the adhesive side till the appearance of high luster in order to ensue the adhesiveness (SNiP II -26-76*). DO NOT heat the material from foil side!